Do you publish content online? 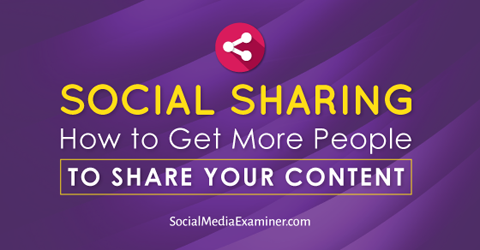 Want more people to share your content? To learn how to get more people to share your content, I interview Mark Schaefer. In this episode I interview Mark Schaefer, author of The Tao of Twitter and Social Media Explained. His blog Grow was awarded #2 on our top 10 blogs of 2015. Mark also co-hosts the Marketing Companion podcast. His latest book is called The Content Code: Six Essential Strategies for Igniting Your Content, Your Marketing, and Your Business. In this episode Mark will explore why people share via social media. You’ll discover what you can do to improve your chances that people will share your content. Listen as Mark Schaefer talks about how to get more people to share your content. Around 2008, Mark started his own business doing consulting and teaching. He realized if he was going to talk about Twitter, blogging and Facebook, he had to use them. So he started a blog as an experiment. It took him about 9 months to find his voice, Mark recalls. It dawned on him that all of his contacts and business were coming through his blog, so he needed to pay attention to it. The blog really started kicking in around 2010, and has been building ever since. Mark started blogging in 2008, and he began to get noticed in 2010. In 2009 Mark wrote a post that was a little bit controversial, called The Social Media Country Club. As a new blogger, Mark felt like an outsider. He says it seemed like all of the influential bloggers were in this club, where they never said anything negative about each other. Mark was thinking, “How are we going to grow if we don’t challenge each other?” Coming from 27 years of marketing experience, Mark expected any channel used for business to be measurable, while others felt it was all about the conversation. Though nervous, Mark started speaking his mind. The reaction was supportive and positive. His audience was grateful somebody finally said it. Listen to the show to discover what Mark blogged about at first and how he felt about it. Whether you’re an individual blogger, working in a business or working for a brand, many niches are getting crowded with content and social media activity. This makes it very difficult to compete. Mark feels this was predictable. He says when the Internet first started, everyone needed a website. If you were the first one with a website, you had an advantage. Then you needed to be found. If you were the first one to figure out search engine optimization, you had an advantage, because you’re going to be at the top of the search rankings. However, after your competitors figured it out, it got harder and more expensive to be in marketing. He says it’s the same thing with blogging. It’s hard to be seen, because people are figuring it out. People are trying to stand out, but creating more or better content isn’t necessarily the answer. For the last year, Mark has been obsessed with figuring out how to maneuver in this very crowded world. And that’s why he wrote The Content Code. Listen to the show to hear my Times Square analogy. 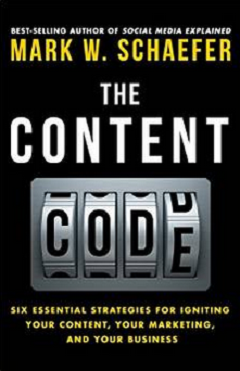 The Content Code by Mark Schaefer. Mark explains how all conversations are about content: creating more, better and optimized. The conversation is about building an audience: How do we get more followers, likes, traction and traffic? Those conversations don’t need to go away, Mark says, but they’re not working anymore. Great content is the starting line. If your content doesn’t ignite, if it’s not creating value for your business, if it doesn’t move through the Internet, if people don’t share it or engage with it, then you’re not getting economic value from the content. The Content Code talks about how to ignite, what it means to ignite and who ignites it. As an act of generosity or kindness to inform or help people. As an expression of their own identity. We have to change our mindset about what this is all about and what’s really driving the economics. Mark says we need to discover who shares, how we find them and how we reward them. We don’t need to build traffic, we need to build trust with the people who are creating economic benefits for our business. Listen to the show to discover why Mark shares content. One company that Mark loves is GoPro Camera. He thinks their key to ignition is that almost all of their content is being created by their audience. The people who are sharing (in the book, Mark calls them the alpha audience) are a very elite group—perhaps 2% of their followers. GoPro elevates this alpha audience. They reward, nurture and celebrate them. GoPro is a little camera that can go anywhere and attach to anything, so it’s become the go-to content creation system for extreme sports and adventures. The company could never create enough content to hold people’s attention, but if you go on their YouTube site, it’s absolutely addictive. GoPro isn’t doing the work. They’re enlisting others, and at the same time, building that alpha audience. And that’s how their social media presence is igniting and growing like crazy. 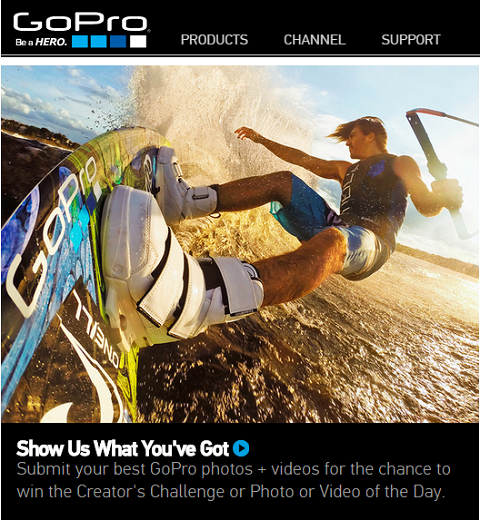 Most of GoPro’s content is created by their audience. Another example is Shonali Burke, who has a PR agency in Washington, DC. Mark says she is the consummate professional who is keenly aware that you are what you tweet and that content either adds to her image or takes away from it. Shonali shares Mark’s content every single day, whether or not she has a chance to read it, because she trusts him. And that trust is something Mark doesn’t take for granted. Mark says he gets approached several times a day by companies that want to pay him to run their content on his blog. He won’t do it, because he won’t break his followers’ trust. He believes building an alpha audience that moves his content is going to create far more economic value than him taking a few dollars for writing a post. 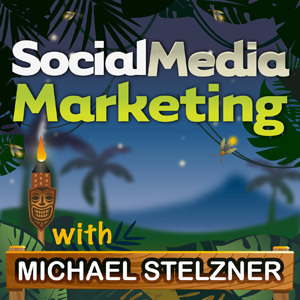 Listen to the show to hear why Mark considers Social Media Examiner a heroic brand. Everybody has followers. Mark has over 100,000 followers on Twitter. But his alpha audience is the people who buy his books, who may hire him someday and/or are the elite group sharing his content. He suggests that could be as little as 2% of the audience. But there is opportunity there. If you’re thinking about content ignition as a long-term strategy, there’s no shortcut. You’ve got to do the work. The people who are igniting the content are creating the value. You have to build it one person at a time. Listen to the show to learn about gray social media and how to reach out to those fans. First of all, you need to understand the fundamental reasons why people share. We have to change our mindset in our businesses and understand the emotional connection people have with content, and not try to create some artificial economic condition. Mark’s friend Ted Wright, who is a word-of-mouth marketing expert, says the people who share content are information junkies. They want to be the first to share. You can’t use coupons to attract these real influencers. There are also tricks you can do with words—like tweaking the headlines, etc.—to make your content more shareable. Creating content doesn’t have to be difficult, Mark believes. It can be as simple as talking to people. However, the ignition stuff will only work if you have good content. Listen to the show to discover how Social Media Examiner uses survey data and other research to come up with ideas for content. Ever have something you need to share with someone securely? There’s a really cool resource called OneTimeSecret.com. Use One-Time Secret to share something securely. 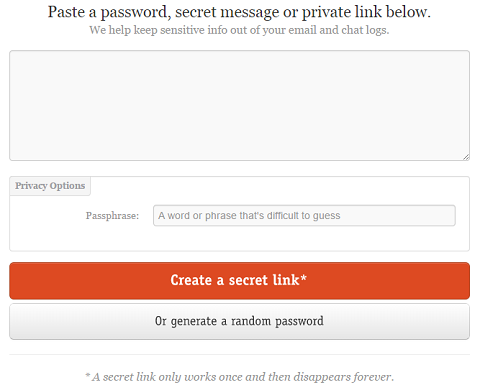 One-Time Secret allows you to paste something like a password, message or link, and assign a passphrase. Then hit Create a Secret Link. The app will generate a special one-time only link that, once used, is gone forever. Email the link to whomever you need to send it to and call the person to share the passphrase. Once they use link and provide the passphrase, they’ll get the unencrypted version. And if they share the link with anyone else, it’s useless. One-Time Secret is a free service, and it’s awesome. Listen to the show to learn more and let us know how One-Time Secret works for you. Connect with Mark on his website, check out his blog and follow him on Twitter. Read The Content Code: Six Essential Strategies for Igniting Your Content, Your Marketing, and Your Business. Check out The Tao of Twitter and Social Media Explained. Explore Social Media Examiner’s Top 10 Blogs of 2015. Read Mark’s post about The Social Media Country Club. Check out the GoPro YouTube page and Shonali Burke’s Twitter. Learn more about Ted Wright. What do you think? What are your thoughts on social sharing? Please leave your comments below.